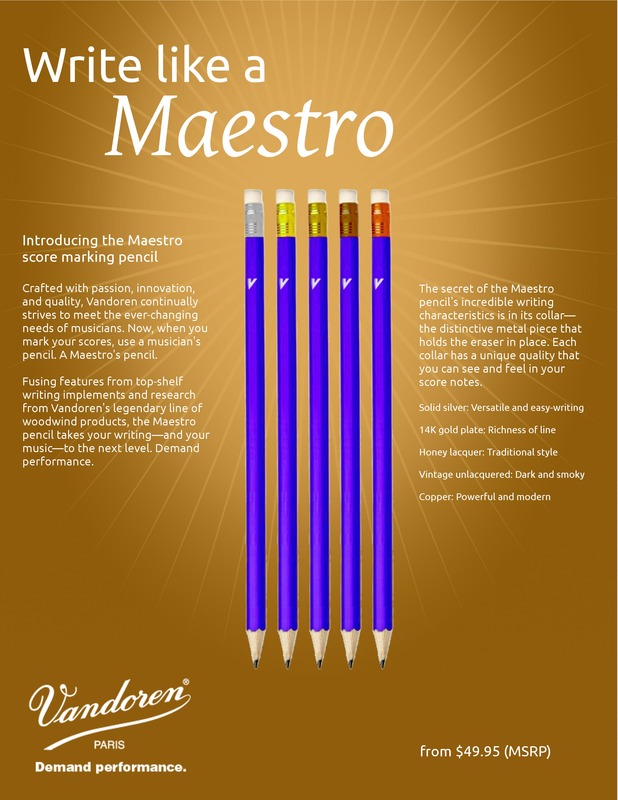 My Vandoren source tells me that the real “secret” is the collars—the little metal ferrules that hold the erasers in place. While some “researchers” have suggested that the collar has little actual effect on the pencil’s writing characteristics, years of experience accumulated by some of the most respected woodwind players in the world say otherwise. And so I was not at all surprised to find that each collar has its own unique, shall we say, signature. Click for larger. You know the drill. I found the 14k gold-plated finish (my personal favorite) to produce the darkest, richest line, and this is the model I recommend for musicians who need to make markings in their scores that are clear and bold without sacrificing nuance. The silver (solid, not plated) writes a bit lighter, though certainly not too light, and with an appealing uniformity of line; these versatile qualities may be especially well-suited to students. I was also able to try brass-collared pencils in a traditional honey-gold lacquer and a “vintage” unlacquered treatment. 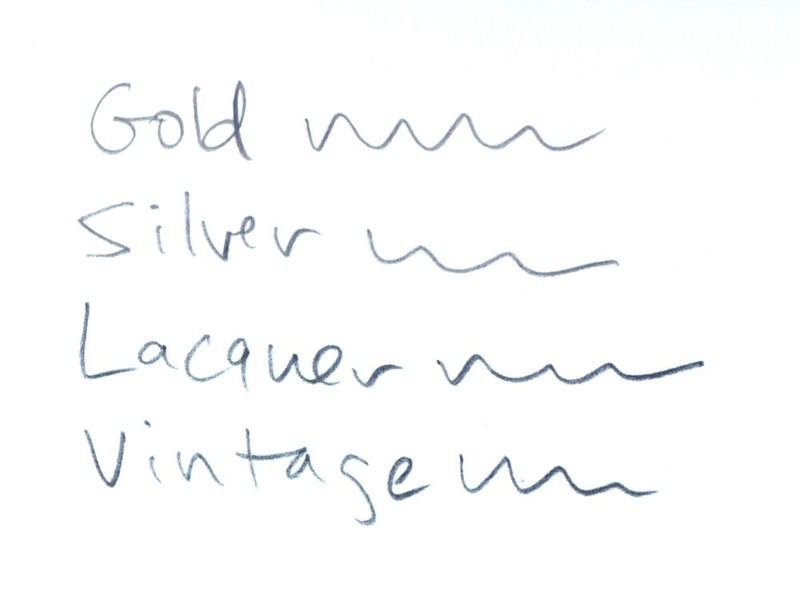 I found the lacquer model’s writing legible but uninteresting, though the vintage had a freedom to it that I would like to experiment with further. There is also a copper-zinc alloy now in production; apparently there was some delay related to determining the exact percentages of each metal to use, and I was unable to try one. Update: Vandoren USA has generously offered to distribute a few free samples to dedicated North American Vandoren fans! To claim yours, share this blog post on Facebook or Twitter (use hashtag #writelikeamaestro), and specify your choice of collar (gold, silver, lacquer, vintage, or copper). Or leave it in a comment below. Even better, do all three! Supplies are limited, offer ends midnight tonight (4/1/2013). Click here for official list of winners. I am very disappointed that they aren’t yet producing a left-handed model. I have to say that I tried these based on the suggestion of a well known player. I was very disappointed. I tried 10 and in the box I only found one to write really well. Even so, the next day I could barely get it to write at all. Left handed people CAN use the right handed pencils if they stand on the other side of the desk.